They do! And they travel together and cover TWICE as much territory! That means TWO volumes of Speed Graphics and Steam 1958! for your reading pleasure! Volume 1 documents the first three days. You’ll revisit your favourite locales and locomotives from your 1957 adventure—and encounter new ones! Speed Graphics and Steam 1958! vol. 1 will be your time machine, your portal to the past. Through its pages you will walk into roundhouses full of steam locomotives, watch Pacifics and Northerns pulling away from station platforms, witness Ten Wheelers trundling way freights along branchlines. In July 1958, your photographers have one task...To capture maximum steam action with their Speed Graphics in mere days. To augment their artistry, your author describes the context of railway operations you’ll witness in Speed Graphics and Steam 1958! vol. 1. For the only time we present the July 1958 Ontario trip by Rehor, Wood and Harwood in chronological detail. Your author pieced 50 rolls of Herb Harwood’s negatives together to choreo- graph the action you’ll enjoy! Harwood’s negatives are now consigned to an institute which may take YEARS to catalogue them. 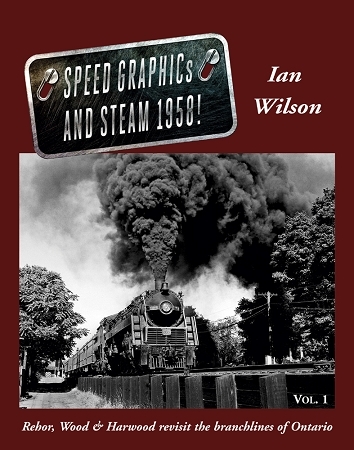 But you’ll discover gems from all three photographers in Speed Graphics and Steam 1958! vol. 1. On the evening of July 13...You’ll start at Windsor and head to Jeannettes Creek (with Wabash action), then experience night-time at the CNR and CPR London roundhouses. Then on July 14 it’s all CNR action...St. Marys and Stratford, then the Brampton Subdivision (Shakespeare, Baden and Breslau) to Guelph for a parade of passenger trains. Palmerston via Elora and Alma. You’ll encounter Ten Wheelers and more at Harriston, Wingham and Mildmay—and north from Hanover. Then down to Listowel, Brunner and back to St. Marys. Your night ends on the platform at Stratford. Finally, on July 15...You’ll catch a CNR passenger train at Shakespeare before seeing Northern, Mountain, Hudson and Mikado classes at Brantford. Onondaga and Caledo- nia follow, with 4-8-4s finishing their careers on mixed trains. At Dundas, you’ll glimpse a Mikado switching the Canada Crushed Stone plant, then we’ll close with CNR and CPR steam and diesel action at Bayview. Some views of this July 1958 trip you have seen before...But never with a unifying narrative and moment-to-moment action. Where else in today’s information overload can you find that context—except in this book? Certainly not on Facebook or photo-sharing sites!